About: 93 Feet East is a nightclub that serves a variety of beers, wines, spirits and cocktails. One of Brick Lane’s longest running clubs and all round popular hangout, 93 Feet East seems to be doing more than ever for London’s late night lovers. Actually, it doesn’t stay open so late, but in a city that’s hardly known for all nighters it does at least cram as much into its opening hours, seven days a week to leave you sapped anyway. The huge building is more like a complex in fact, with multiple rooms and a cobbled terrace filled with benches. The entrance gives you a bar to lean up against, as well as a sparse selection of seating and its own sound system. Through the corridor you’ll find the club that comes complete with stage and yet another bar, which hosts live performances, DJs and all manners of fun times. It seems to be every student’s favourite space but by no means will older guests feel out of place- if they avoid the indie discos, which are more Bombay Bicycle Club than Shed Seven, although you’ll probably get a bit of The Smiths. Many of the nights are free and if not prices are usually reasonable which is more than can be said for the bar where cans (cans!) will set you back more than the price of a pint. Aside from this though, there’s not a lot to gripe about, it is what it is and an attractive griminess is always the sign of a good club. 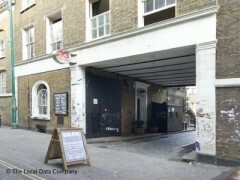 "A club with as many moods as there are days in the month"
93 Feet East has to be one of London’s most versatile venues. From up-and-coming indie band showcases with punters swaying to the music in tight jeans, to achingly cool electro-pop attracting hipsters in non-prescription specs, to the messy, hedonistic Sunday afternoon Fuse parties where the club can at times turn into one big moshpit, there are as many moods to this Brick Lane institution as days in a month. Through the entrance, a hall leads to two rooms, one is small and pink with wooden benches stacked in places that can become awkward for the hundreds of dancers trying to manoeuvre around them, with a bar at the back and a raised DJ booth and stage facing each other at the opposite side of the room; the other is a larger, darker version of this room. The large courtyard sees freezing smokers huddle under heaters in the winter, but it comes into its own in the summer months when the barbecue entices hungry clubbers in need of nourishment. While 93 Feet East closes at the tragically early time of 1 am at weekends, its prime location means it’s possible to skip onwards to any Shoreditch nightclub to continue the shenanigans. "Cool and contemporary East London venue..."
93 Feet East has a courtyard, three big rooms and an outdoor terrace that gets crowded with the cool East London crowd on sunny afternoons. There are some famous nights, like the REALLY popular 'rave, bling and trash' on Friday (a Styleslut and Wasteclub event). Sunday afternoons are relaxed: there’s Rock'n'Roll and there are short film screenings for those who just want to kick back and forget about the Monday morning to follow. Description above makes it out to be exclusive and people just sitting around. Not really like that- the times I've been people are friendly, no real attitude, more a club than a cocktail spot and on the weekends they usually have barbecues on the benches outside. When all the rooms are in use the place is big. I go for the good hiphop (bar area) on a busy weekend night, pre Herbal or for loungey funky beats on a lazy afternoon. Decent food near there too and not too far from the Shoreditch bars if you decide to change your mind.